I've been reading and seeing a lot of this, recycling clothes and revamping them into hot, new, fresh clothing. I've been making all of my items from scratch and decided to take the challenge on. I recycle to save this beautiful planet we live on and incorporating it into my handmade craft business makes it that more special to me. I'm working with right now tops that are plain or have stripes. 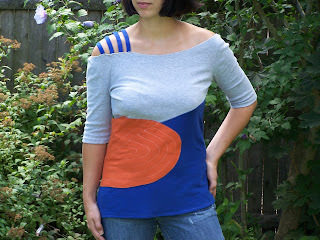 I like ones that have long sleeves so I can either cut them off or shorten them to add that extra fabric to another top. 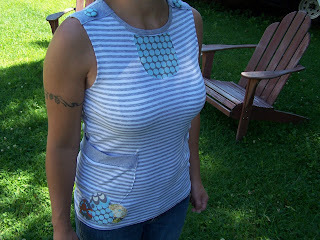 Perfect example, for my gray and white stripe top I used the sleeves for pockets. I also don't mind minor stains. 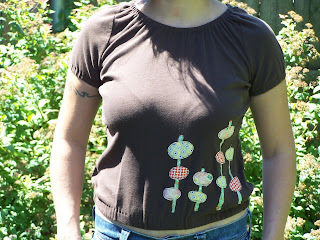 Areas like those I can applique some of my print fabrics and make shapes or objects. When I buy my fabrics majority of the time I know exactly what I'm going to make. These tops are blank canvases for me to stare at, sketch out some designs, cut, and then sew away. This is new for me and I hope that I inspire people to recycle their items and create! A book that inspired me is Tease 50 Inspired T-Shir Transformations by Superstars of Art, Craft & Design.